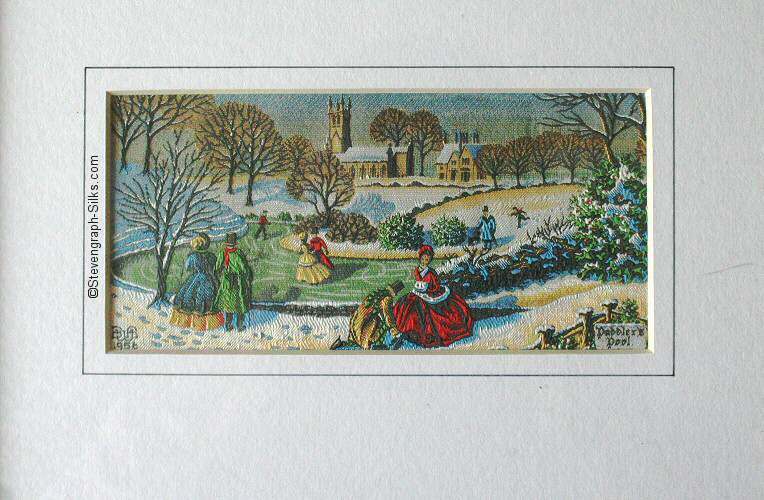 The image of this silk was very kindly donated by Mary Brittan, UK. Paddlers Pool, situated in the woods near Hurdsfield Church, is one of the old reservoirs which supplied water to drive the water wheel, the motive power for the Brocklehurst Mills at the beginning of the last century. The water was controlled by a wooden paddle or sluice, from which the pool derived its name. At the beginning of the 19th century water was used to provide the power to drive the machinery, and the Hurdsfield Mills were no exception. 1956 saw this fact commemorated with the appearance of PADDLERS POOL. In 1956 the latest type of Jacquard card cutting equipment was introduced by BWA. The previous 840 ends (hooks) on the six box loom was changed to conform to the 768 of the new equipment. From this point, even had any future management wished to do so, it would have been impossible to re-weave any existing pictures. As Paddlers Pool was the first of the 'new breed' of woven silk pictures this may have had a bearing on the fact that it has become one of those most difficult to obtain.